Consisting of twelve newly commissioned essays and enhanced by William Molyneux's famous early translation of the Meditations. 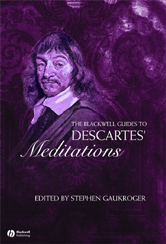 Situates the Meditations in its philosophical and historical context. Touches on all of the major themes of the Meditations, including the mind-body relation, the nature of the mind, and the existence of the material world.